NEW YORK -- Duke has not won a bowl game in over 50 years and Indiana has not won one in over 20 years. The two schools are more known for basketball and will rely on high-scoring offenses to try to end lengthy droughts in Saturday's Pinstripe Bowl at Yankee Stadium. 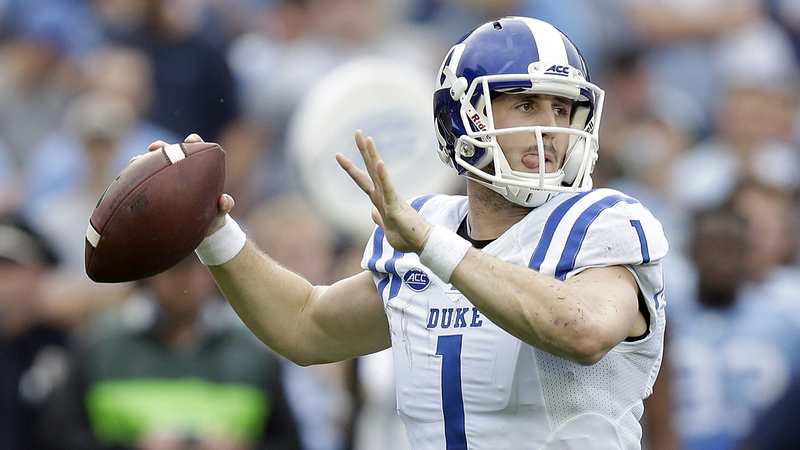 "I like the diversity of our offense," quarterback Thomas Sirk said. "We spread the ball out a lot and I don't think that we have any limitations. We can go under center. We can spread it out. We can run option, and then we throw the ball down the field." In 2012, Duke gave up two touchdowns in the last minute to Cincinnati in the Belk Bowl. In 2013, the Blue Devils gave up 35 points after halftime to Texas A&M in the Chick-fil-A Bowl, and last year they allowed the winning touchdown with 4:45 remaining in a 36-31 loss to Arizona State in the Sun Bowl. "We lost bowl games in just about any way possible," safety Devon Edwards said. Since Wilson went from being Oklahoma's offensive coordinator to Indiana in 2011, the program has set 47 school records on offense, scored at least 35 points in 23 games and more than 50 five times. Sudfield is the school's all-time leader with 58 touchdowns and 7,490 passing yards. He also led the Big Ten in seven offensive categories and tied for the league lead with 24 touchdowns. "We just want to win any way possible, but to actually put up a lot of points it means we're doing our jobs on offense," Sudfield said. CASH'S REPLACEMENT: Duke will be playing without safety Jeremy Cash, the ACC's defensive player of the year. Cash underwent surgery on his wrist Dec. 16 and the senior finished with his career with 333 tackles, six interceptions and nine forced fumbles. Cash played through the injury during the regular season. Junior Corbin McCarthy will likely fill Cash's role in Duke's 4-2-5 formation and Edwards will shift from safety to cornerback. HOWARD'S STATUS: Indiana may be without running back Jordan Howard, who has not played since exiting the Nov. 21 win at Maryland with a knee injury. He has practiced this week, but Wilson said Indiana will not know if Howard can play until near kickoff. The junior transferred to Indiana after UAB disbanded its football program last season and rushed for 1,213 yards despite missing two games with an ankle injury. If Howard does not play, Devine Redding will continue filling in. Redding rushed for 274 yards in the final two games and totaled 785 rushing yards and eight touchdowns. MONTGOMERY'S LAST GAME: Saturday will mark the last game for Duke offensive coordinator Scottie Montgomery. Montgomery accepted the head coaching position with East Carolina on Dec. 13 but decided to stay on for the bowl game. PREVIOUS BOWL EXPERIENCE: While Wilson is guiding Indiana to its first bowl since taking the job, he does have experience in bowl games. He played in four as an offensive lineman for North Carolina (1980-1983) and coached in three national championship games with Oklahoma. Duke's David Cutcliffe is in his 26th bowl game as an assistant or head coach.